World renown as one of the premier fishing destinations on the planet, Cabo San Lucas is home to numerous species of fish, competitive and accomplished fishermen, and one of the most prestigious fishing tournaments in the world. If you're an outdoorsman, sportsman, or fishing enthusiast, Cabo fishing is a must, not an option. You simply have to fish it to believe it. Cabo fishing boasts fertile waters and a diverse underwater community of fish, sharks, and sea life. Whether you're Cabo deep sea fishing, fly fishing, or just want to spend a few hours angling off the reef, we here at Cabo Fishing Fleet can help you make the most of your Cabo fishing trip. At Cabo Fishing Fleet, we offer Cabo deep sea fishing, light tackle fishing, and fly fishing to accommodate anglers of every age, interest, and skill level. If you're after big game marlin, dolphin, tuna, or any other regional sportfish, Cabo deep sea fishing is the choice for you. If you're not feeling competitive, fly fishing and light tackle fishing may be more your speed. However in the waters of Cabo, don't be surprised if you pull some large fish while relaxing in any boat. We are called Cabo Fishing Fleet for a reason, we have a large army of fast, reliable, and tuned up boats. Our selection of fishing vessels ensures that we will have the right boat to fit you, your party, or your family's needs. From our 70' Cabo deep sea fishing charter to our 24' fly fishing sportster and everything in between, we've got the boat that is right for your trip, no matter the size of your party. To make the most of your Cabo fishing trip, you need to know what you're doing. That's why we at Cabo Fishing Fleet employ world class instructors and champions to help you land the biggest fish you can while you're out in the water. Our instructors have been featured on ESPN, OLN, and the Sportsman's Channel and also in the pages of Sport Fishing Magazine. Among the best fishermen in the world, we can help you learn to fish no matter your skill level. Our superior instructors know their way around the water and will show you the best spots to catch the biggest fish. If you're going fishing in Cabo, you will want to make the most of your time on the water. With experienced instructors and guides, a fleet of versatile boats and yachts, we'll get you to your spot quickly and safely, leaving you more time to reel 'em in. 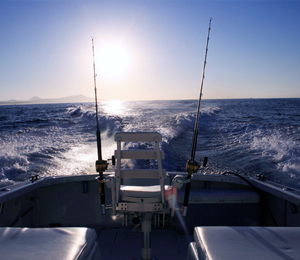 And with an array of fishing packages, Cabo Fishing Fleet is your destination for a fun filled fishing adventure that won't break your bank. Looking for water sports in other destinations? Try scuba diving in Key West or the Dry Tourtugas National Park. If the Bahamas are more your style, they also feature excellent scuba in Bahamas and Bahamas dolphin encounter.